When first-time Walt Disney World visitor Chris Bales took these photos in March 1996, he had no idea that I would match his photos almost exactly 20 years later. 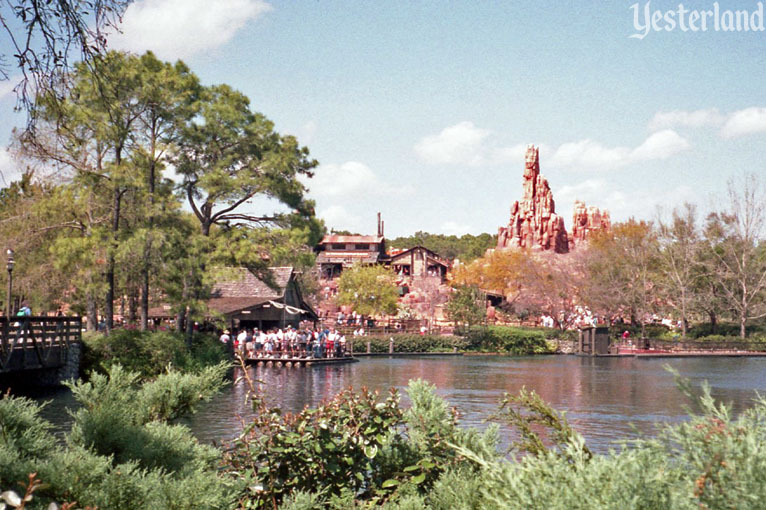 Part 1 of this series had seven pairs of photos comparing the east side of Magic Kingdom Park in 1996 and 2016. Let’s continue to the west side. , Curator of Yesterland, March 18, 2016. 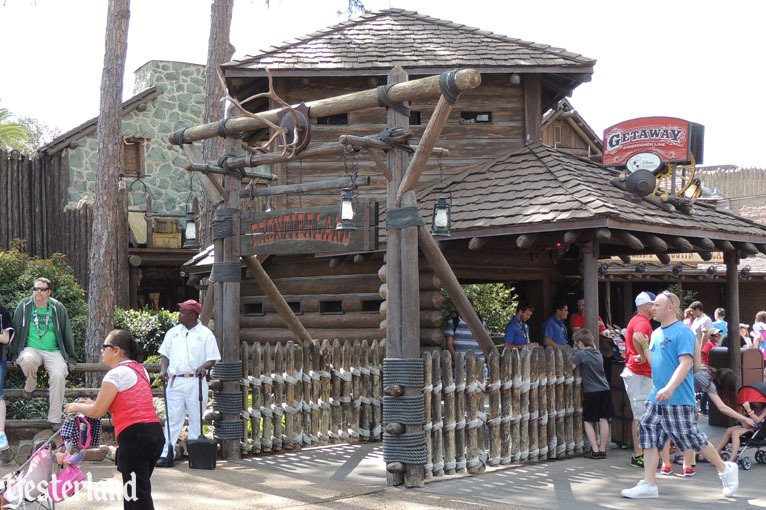 At Disneyland, the main entrance to Frontierland is a prominent stockade just off the Hub. 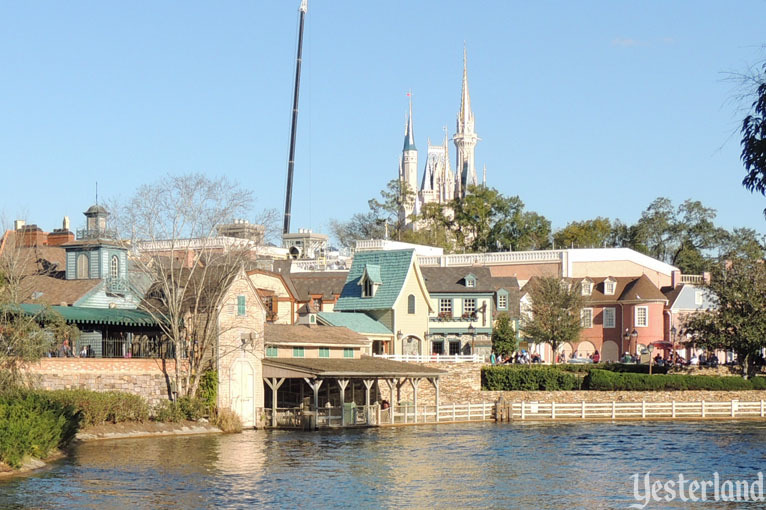 Magic Kingdom Park has a stockade too—sort of. The path from the Hub leads to Liberty Square. Then at the transition point to Frontierland, there’s a nod to a stockade, but it’s easy to miss. 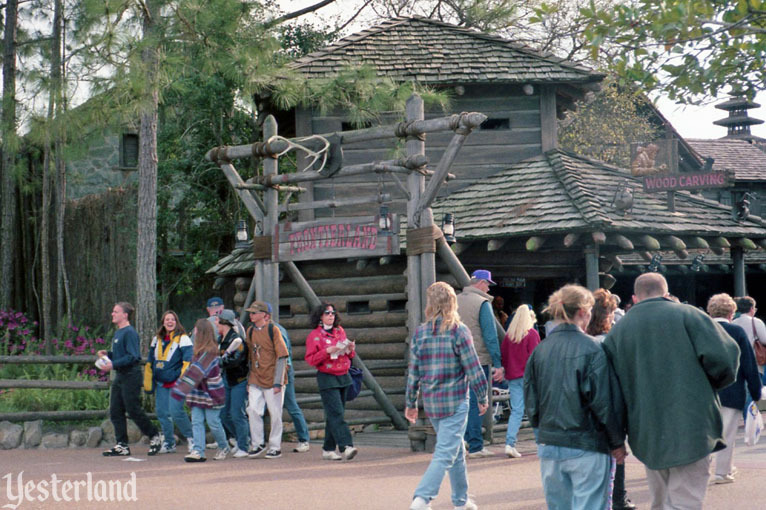 In the 1996 photo, the shop in the stockade was Frontier Wood Carving, Presented by Rubio Artist Co. The same location is now the “Getaway” Disney Vacation Club kiosk. The major difference between the 1996 and 2016 photos above is not what’s in the distance; it’s what’s in the foreground. 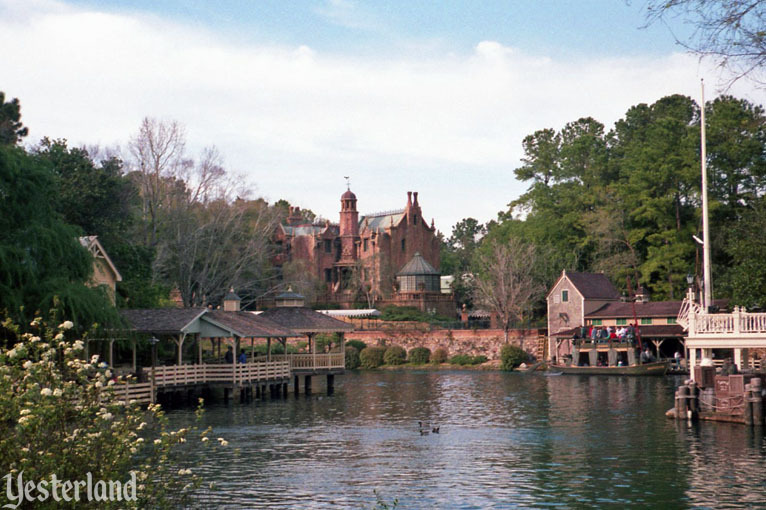 In 1997, Disney changed the shore of the Rivers of America. Gone was the natural riverbank. In its place, a new boardwalk along the water improved the ability of this part of the park to keep guests moving, especially during parades. Kids in elementary school learn that the real name of Tom Sawyer author Mark Twain was Samuel Langhorne Clemens. 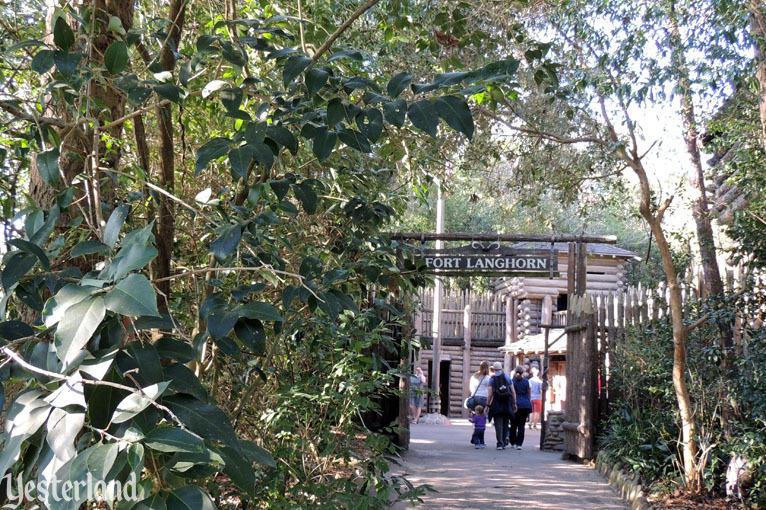 It’s fitting that the fort on Tom Sawyer Island is named after him. 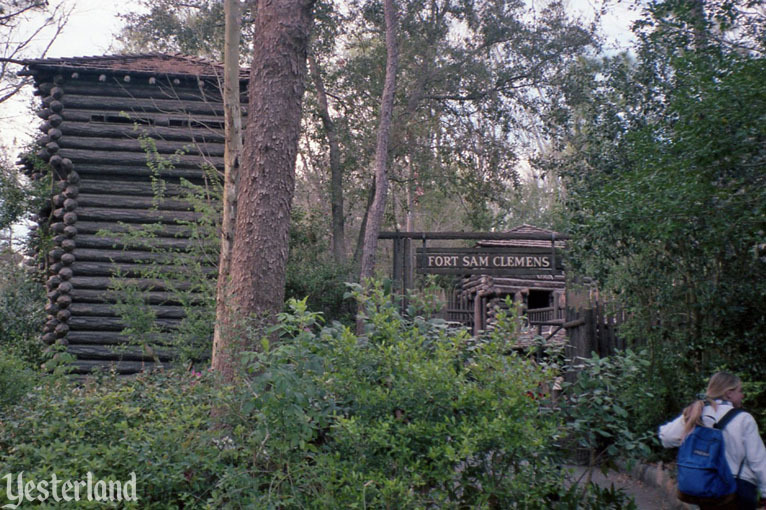 When the island opened to guests in 1973, it had Fort Sam Clemens. That was still the name in March 1996—but not for much longer. It soon became Fort Langhorn (without the “e” of the author’s middle name) and that’s how it still is today. 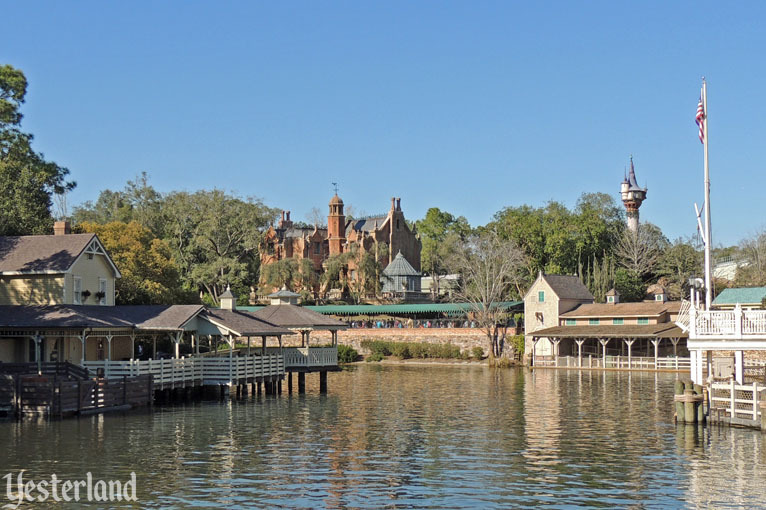 In yet another dazzling display of promotional synergy Walt Disney Co. is changing the name of Tom Sawyer’s Island at both the Orlando and Anaheim theme parks to Tom and Huck Island to promote its latest video release, Tom and Huck. The video promotion will be a monthlong celebration, which seems like a longer time than the film survived at the box office. None of this explains why the fort became Fort Langhorn as part of the promotion. There is no prominent, self-referential fort in the film. 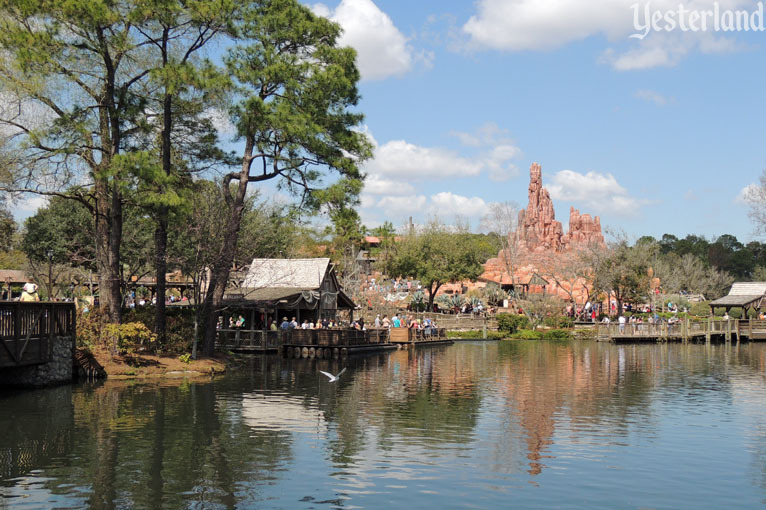 At first glance, there aren’t many differences between the two photos of the Rivers of America, except for the trees. But look closely. 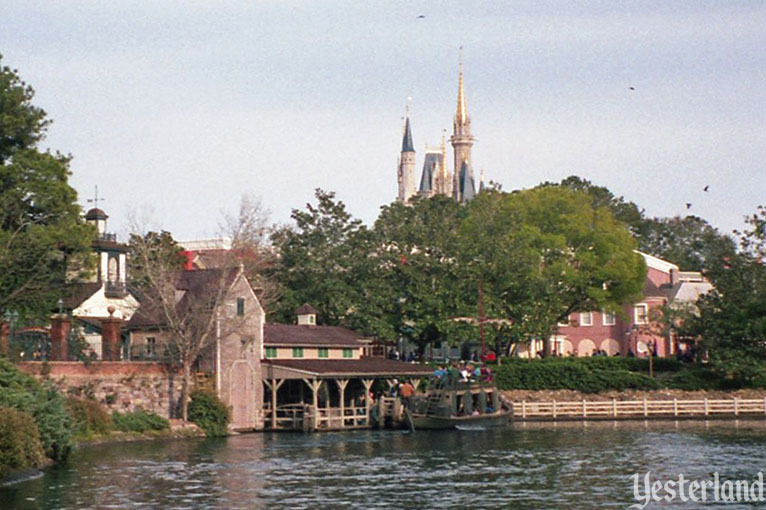 There’s a Keel Boat at the dock in the 1996 photo, and Fantasyland’s Rapunzel Tower has become a prominent landmark of Early America. The two photos above both show the dock for the Mike Fink Keel Boats attraction—but going on the ride was only an option in the older photo. It would close permanently April 29, 2001. The striking difference between the two photos is how the trees have been trimmed or eliminated. In the 2016 photo, the “big box” show building for Hall of Presidents is exposed. The structure with the blue roof in the center of the newer photo was built for paper FASTPASS distribution. Cinderella Castle is much more prominent than Rapunzel Tower in a previous photo, but somehow seems less intrusive. Perhaps it’s because the castle is a symbol of the whole Magic Kingdom and has been there since opening day, while it’s odd that Rapunzel Tower was built so close to the Haunted Mansion. 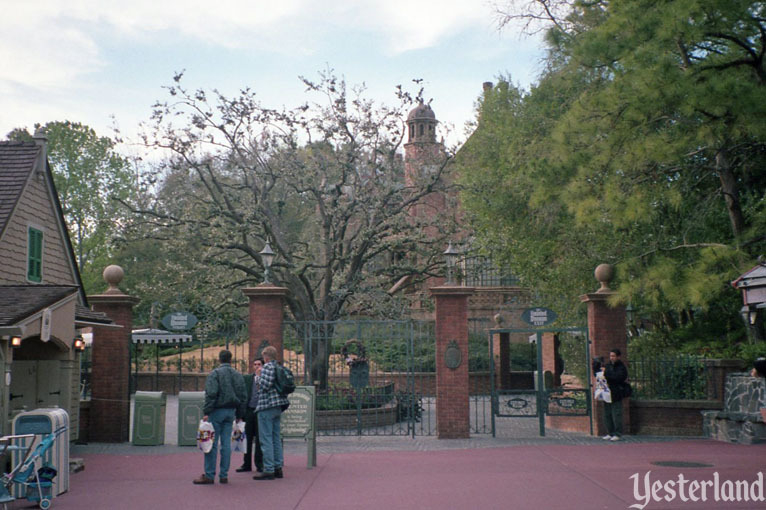 In the 1996 photo, Haunted Mansion is closed. In the photo 20 years later, it’s open and very popular. The tree just beyond the gate is now gone. Without it, there’s more room for guests of this opening day Magic Kingdom attraction. 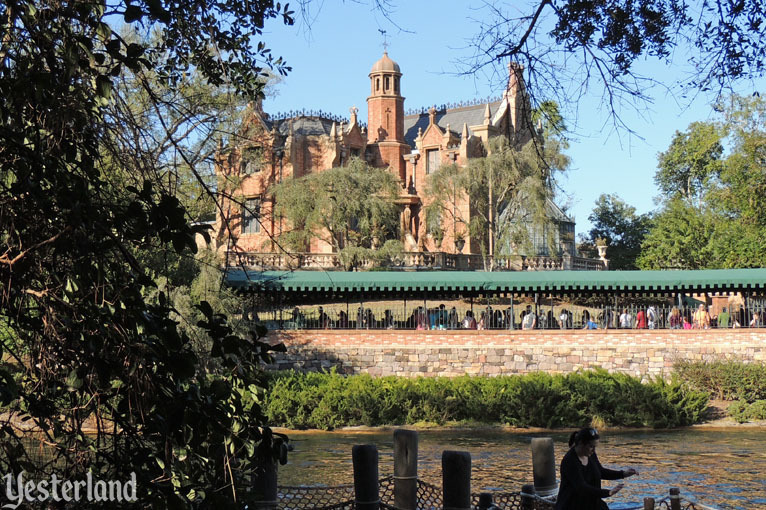 The two biggest differences in the final pair of photos is how the bushes along the “river” are neatly trimmed in the older photo and how the canopy for the Haunted Mansion queue has become longer and wider in the newer one. 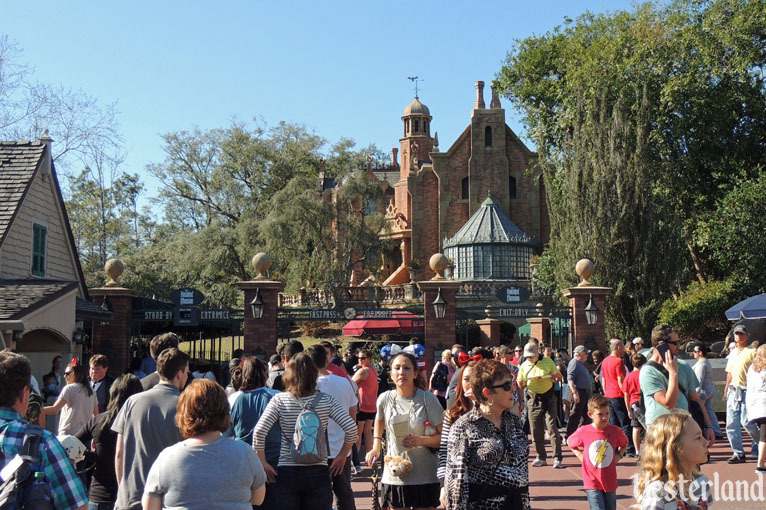 The architecture of Magic Kingdom Park’s Haunted Mansion evokes 19th century Dutch Gothic style manor houses of the American East. It fits well with Liberty Square—just as the Southern antebellum mansion at Disneyland fits well with New Orleans Square. 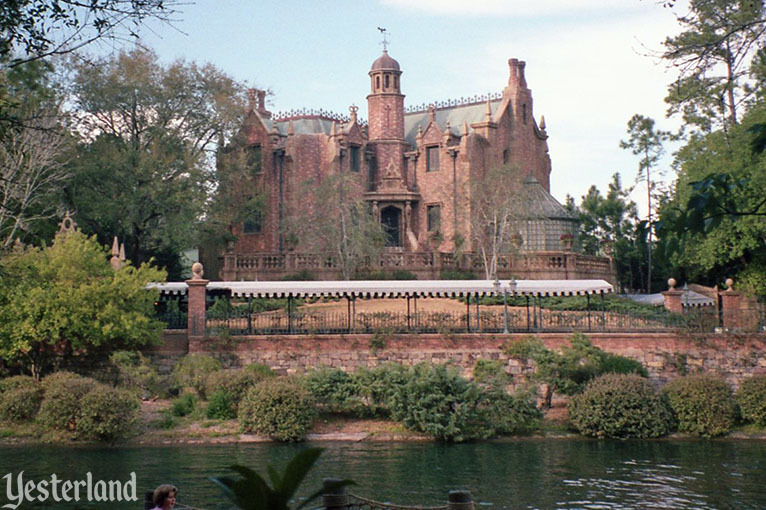 The Eastern Haunted Mansion looked great in 1996 and still looks great today.